This Flemish villa was purchased by a family in Belgium for its ideal location and the large garden. The only problem was that the home was old and dated. The family worked together with Edouard Brunet and François Martens to create a bright and open home that would still keep the original spirit of the home. Here’s a look at the front of the home and its old architecture. The original artificial black slate roof tiles had faded and were updated to match the brick style on the rest of the house. 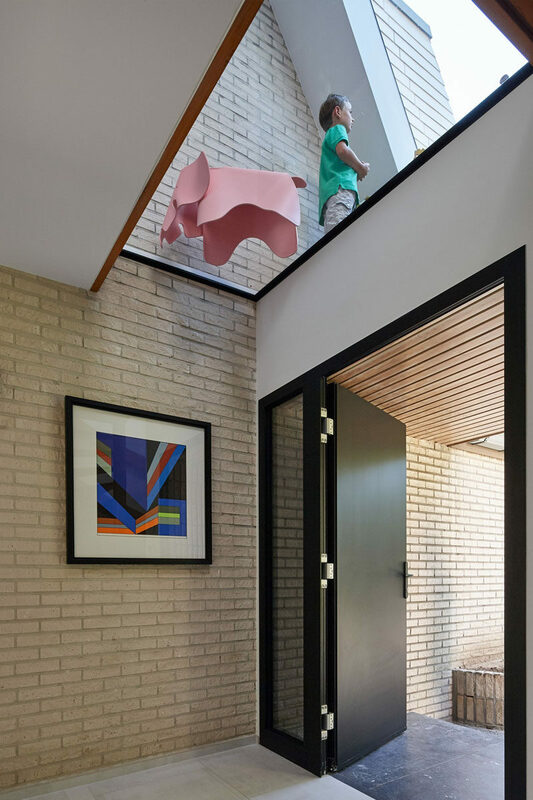 The entire interior of the home was renovated, and just inside the front door, a skylight is now present to light up the entry of the home. Before, the living areas were separated and didn’t take advantage of beautiful backyard views, now the interiors have been opened up and are bright white, making the space feel modern and allowing you to focus on the plants outside. 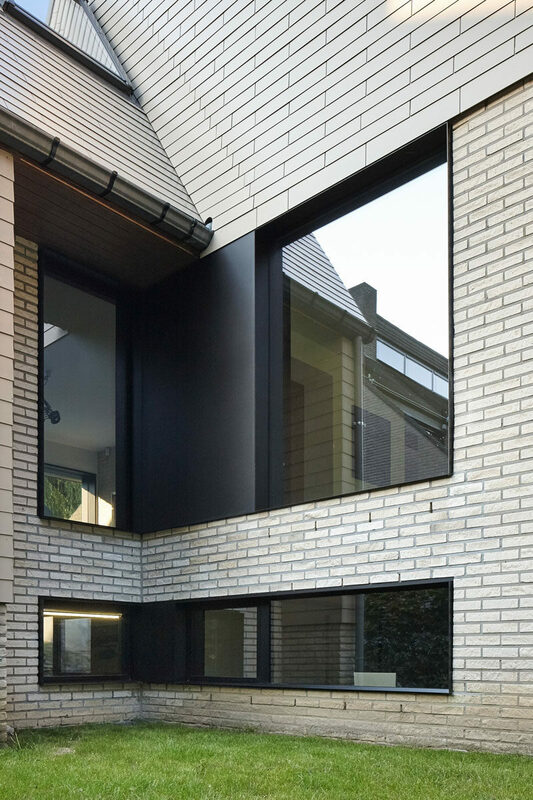 Black framed windows and light wood floors have been included in the updated design of the home. 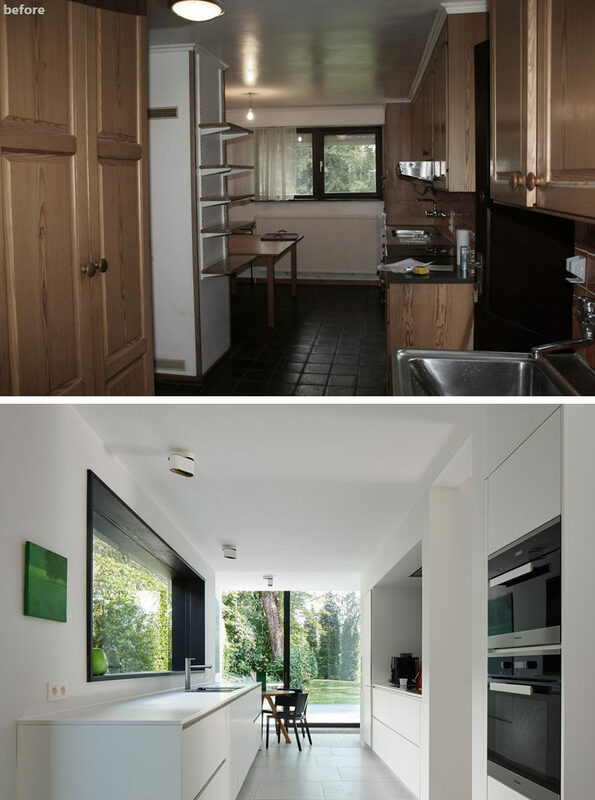 The kitchen received a dramatic makeover, with the old dated cabinets and dark floors replaced with bright white cabinets and a light floor. The windows were replaced and the kitchen now looks out onto the backyard through floor-to-ceiling windows. Just off the kitchen is a small space for dining, while just around the corner, there’s a larger dining table. The interior living area also opens up to the backyard where there’s a patio with additional seating. 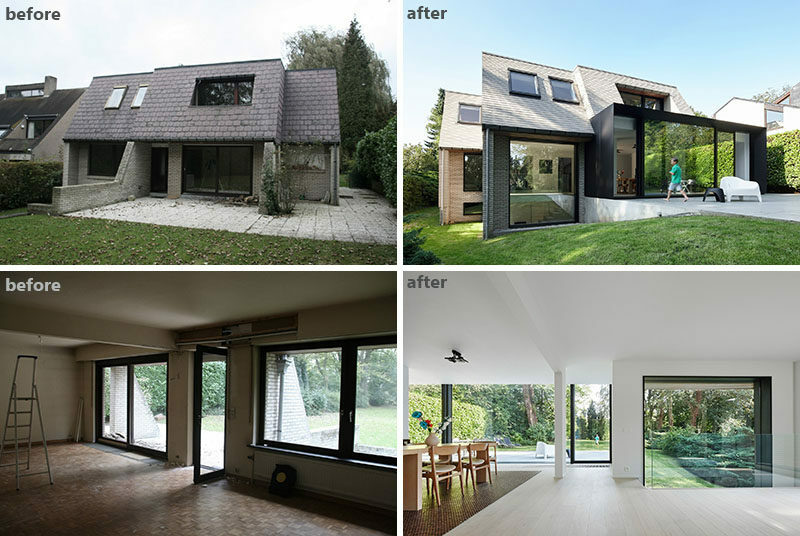 At the rear of the home, you can see that the designers extended the home out into the backyard slightly, and small windows were replace with larger ones, allowing more natural light to fill the interior of the home. Here’s a closer look at some of the new windows in the updated home.